Advanced driver assistance systems (ADAS) can include a rear camera, rear parking sensors, 360° camera system, blind spot detection, lane departure warning, adaptive cruise control, and other forms of collision warning. Not only is it important to be able to be able to identify these systems, but it is also important to understand the calibration requirements. 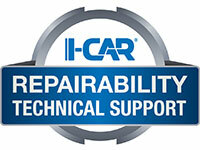 For the past several months, I-CAR and subject matter experts from vehicle makers, collision repairers, insurers, and tool and equipment makers have been meeting to develop, update, and publish an I-CAR best practice on Damage Analysis for ADAS Identification and Calibration Requirements.